Wedding services are conducted at St John’s according to the Anglican wedding rites. Who can be married at St John’s? Marriage enquiries, including from divorcees, other faiths or denominations, etc. are welcome – please contact the Vicar, who will advise you on documentation necessary in particular circumstances, such as divorce or death. Usually, the Vicar will be the celebrant at St. John’s. How many does the church hold? The church holds approximately 180 people. The music, hymns, readings, and other elements of the service can be discussed with the Vicar. There is a reasonably flexible approach to these things at St. John’s. Confetti is allowed, but must be thrown outside the church doors. There is usually a minimum of three interviews for marriage, including necessary paper-work in the first interview. We recommend you contact the Vicar once the marriage date is set. A minimum of thirty days is necessary in order for the Notice of Intended Marriage, a Government document, to be validated. All documents are handled and prepared by the Vicar, including the Marriage Certificate. Clearly, the earlier we know the better, to allow good spacing between interviews. 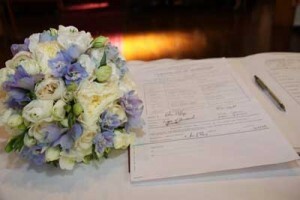 The wedding charges are set, but will depend on whether you require the organist, prepare your own flowers, etc. This can be discussed with the Vicar who will advise you.